On the inside, I’m still about 7 years old. There’s a shelf in my bedroom dedicated to Disney movies. When I’m stressed, I’ve been known to break out coloring pages. I’m still a little upset that I didn’t get my Hogwarts letter when I was 11. I look back on my childhood as a simpler time, when there just weren’t so many things to worry about. And that’s why this billboard that I recently came across struck me especially hard. The ad, if you haven’t seen it, features three slim, happy children playing on the higher end of a see-saw, and an overweight, sad-looking boy holding a bag of chips on the lower end. The slogan? “Once, kids played like their lives depended on it. If only kids still did.” This friendly fat-shaming message was brought to you by the American Academy of Orthopedic Surgeons (AAOS). Now, I’m not claiming that kids don’t need to play outside. I don’t believe that sitting on the couch playing video games and eating truckloads of Cheetos is a good way to spend one’s childhood. (Not to mention the Cheeto dust getting all over everything. That stuff’s insidious.) I think we all agree it would be a good thing if everyone in America were happy and healthy, in whatever way felt right for them and their bodies. But fat shaming is not the way to accomplish that. For those of you who think you aren’t familiar with fat shaming, trust me: you are, you just haven’t heard it referred to by that name. Fat shaming is the idea that your body shape is everyone’s moral issue. Simply put, if you’re fat, it’s your fault, and you’d be better off if you did something about it. If a family member suggests you should skip dessert because your dress size has two digits; or if a doctor focuses only on your weight instead of your symptoms; or if you’re being used in a public service announcement as the worst-case scenario, you are being fat shamed. There’s a psychological theory behind this, called operant conditioning. Here’s the gist: each time a subject does something the experimenter doesn’t like, the subject receives a painful consequence until it learns not to repeat the behavior. If this sounds like something designed for lab rats, that’s because it is. Some people argue that even though those on the receiving end of operant conditioning are treated poorly, the shame gets the desired result in the end. If making children feel worthless and unlovable gets them off the couch and out onto the playground, isn’t it worth a few years of trauma? Shame as a motivator is pervasive in weight loss culture. According to the reality television program The Biggest Loser, the best way to encourage an overweight person to begin exercising is to repeatedly remind them that they’re unattractive, lazy, and otherwise going to die. This can be done either by yelling oneself hoarse or getting more artistic and locking them in a coffin for up to 20 minutes to remind them of the consequences of obesity. The ends justify the means, right? Aren’t we supposed to tell our kids that we love them the way that they are and encourage healthy self-esteem? But then we treat overweight children as an “epidemic,” and we belittle and ridicule them in the name of “health.” I smell a contradiction. 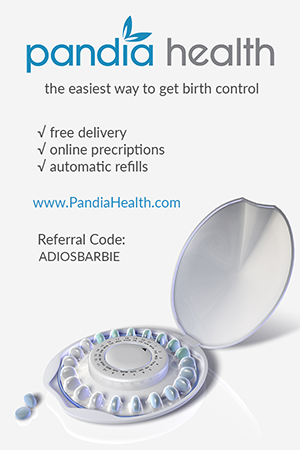 We should be supporting health for America’s youth, no doubt about it. But societal norms are not health, and shame is not support. Ads like the AAOS billboard or the Georgia anti-obesity campaign are not the only ways we’re telling our kids that they only have value so long as they’re thin. In a controversial move, NBC’s The Biggest Loser has teamed up with Seventeen Magazine (which, irony of all ironies, features a section called “Body Peace Pledge,” encouraging teens to love themselves as they are) to feature childhood contestants for the first time. Pause for a second to let that sink in: some of the new contestants on The Biggest Loser are 13 years old. Yes, trainers have said that the teenagers will not participate in weigh-ins, nor will they be yelled at (or, hopefully, locked in coffins). But this teaches overweight American teenagers that as long as they’re overweight, it’s okay for them to be gawked at. It’s acceptable to push themselves so hard to lose weight that they damage their health, and it’s natural to hate their bodies until they change them. What does it say about us when a show that encourages fat shaming, disordered eating behaviors, and outright cruelty gets a 21% rise in ratings when it extends its tactics to teenagers? The Biggest Loser’s proponents claim that the drastic lifestyle changes the show encourages may prevent the life-threatening consequences that are commonly associated with those who are overweight: diabetes, high blood pressure, heart disease, etc. But I can only speak for what I’ve seen. Public weigh-ins in front of entire towns, using junk food as punishment, and of course simulated death as a motivator to crank the treadmill up one more notch… all of these are clear strategies for making overweight individuals feel terrible about themselves, and they reinforce the idea that weight is something to be ashamed of. Not to mention, of course, the inundation of longitudinal health studies that prove to us that weight cycling, or repeated weight loss and subsequent weight gain, has consequences of its own. Sixty-five percent of people who rapidly lose large amounts of weight regain it within three years,which is hardly surprising. The weight loss program proposed by The Biggest Loser isn’t sustainable for people without eight hours a day to devote to exercise. Weight cycling, alternately known as yo-yo dieting, has been linked to a weakened immune system, high blood pressure, heart disease, and a slowed metabolism. This last side effect may actually cause faster weight gain, since the body is accustomed to operating in survival mode and will respond to changes in intake more dramatically. We want our children to grow up to be happy, healthy members of society – regardless of the numbers on the scale. We need to teach them to accept themselves for who they are and what they can do, not what they look like. We need to ditch shame and use love instead. Engaging in healthy eating and exercise are great, but without healthy self-esteem, what kind of message are we sending? Kids learn by example. Show them that fat shaming is unacceptable. Encourage health that isn’t based on appearance or size. Aim to love your body. If you’re in the process of learning to accept your body, be conscious of not engaging in “fat talk” in front of children. Discourage unhealthy diets and negative self-image as soon as you see them surfacing. Please, let kids fantasize about being firefighters and doctors and Spiderman. Don’t replace their dreams with shame and diet plans. If this continues, we’ll all be the biggest losers. 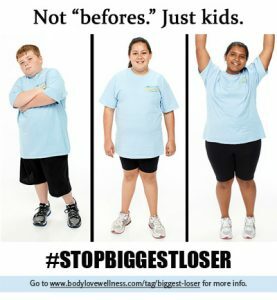 Image courtesy of Body Love Wellness with Golda Poretsky and the post “The Biggest Loser Is Coming For Your Kids #stopbiggestloser. Used with permission. Shame does not drive my behavior and when it does it has a NEGATIVE impact on my behavior. I try not to let others opinions of me dictate my behavior. It doesn’t always work because of the way our society is but I try not to let shame, fear and embarrassment tell me how to behave. I don’t yell swear words because it’s wrong, not because I’m worried about what people will think of me. I don’t call gay people the f-word because it’s morally wrong and hurts their feelings not because I’m worried that my neighbor will think I’m homophobic. It’s morally wrong to kill someone or steal or make someone feel bad intentionally. It’s not morally wrong to be overweight. I would never want someone to feel bad for something that is not morally wrong. I personally don’t think shame SHOULD be the reason for someone to want to lose weight. Should we start shaming people for not using Botox, for not wearing makeup, or for wearing sweatpants? It’s so superficial. Education drives people’s behaviors in a POSITIVE way. I don’t smoke because I learned it could cause me to get cancer not because people will shame me for smoking. Shame and embarrassment are just so negative. Education, conversation, help, encouragement and inspiration are just so much more positive. I’d rather change the world with positivity.